Antonio Maurizio Scianna was born in Palermo in the 1977. He studied at The Academy of Fine Arts and lately has been pick out and chosen to be a part of the ITALIAN TOUCH OF CLASS. His artistic studies concern The Mediterranean method of ceramics dated from the 1600's to the present. In 1999 he opened his artistic workshop, where he creates tiles with antique materials and methods. 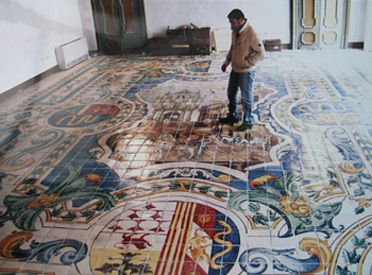 His more imporant works are the reconstruction of tiled floors in several historical buildings in Palermo, such as: The Palazzo Ganci, Palazzo Aiutami Cristo, Palazzo Napoli, Palazzo Burgio, The SS Elena and Costantino's Oratory, Palazzo Pasqualino and Villa Valguarnera in Bagheria.